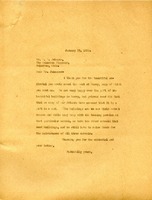 Martha Berry thanks M.r Johnson for the beautiful editorial that he wrote. She explains that the gift from Mr. Ford was not cash and only helped the Girls School. She expresses the needs for the other schools' maintenance.